A futures market is a central marketplace that brings together buyers and sellers. Instead of trading a physical product in the futures market ­- such as phones, clothing, or corn – individuals buy and sell futures contracts. A futures contract is a binding agreement to buy or sell a product on a future date at a specified price. Just like any product that is bought and sold, every futures contract must have both a seller and buyer willing to trade a contract at an agreed upon price. 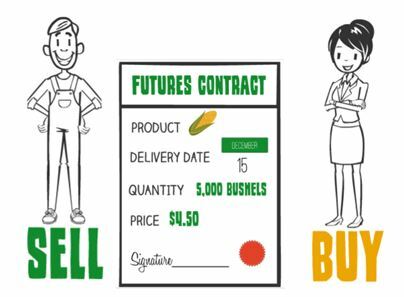 For example, if Farmer Sam sells a December corn futures contract at a price of $4.50 per bushel, the contract buyer is purchasing this December corn contract at a price of $4.50 per bushel. As the seller, Sam is locking-in a $4.50 selling price for 5,000 bushels of his corn that he agrees to deliver in December, while the buyer is locking-in a $4.50 purchase price for 5,000 bushels of corn that she agrees to receive in December. At this point, the physical corn has not moved. The seller and buyer have simply made an agreement for a future transaction. *Think of this like a cell phone contract with a wireless carrier. Imagine your parents selected a cell phone plan where they pay $250/month over the next two years. Even if the same cell phone plan offered from the wireless company becomes more expensive over the course of the two-year period, your parents will not pay more than the agreed upon $250/month amount because both the seller (wireless carrier) and buyer (your parents) have agreed to this price. Notice that the only aspect of the futures contract that is not standardized is the price at which the contract is bought or sold. The prevailing market price is determined in a futures exchange and changes as contracts are traded and expectations about supply and demand shift. Bullish and bearish are terms frequently used to describe the market. A bull market is associated with upward trending prices. A bear market is associated with downward trending prices. What’s the difference between a forward contract and futures contract? A futures contract may sound similar to a forward cash contract that was discussed in Module 9. So what’s the difference between the two? A forward contract is a private contract negotiated directly between a buyer and seller of a commodity and the terms are not standardized. For example, a producer may negotiate a forward contract with a merchandiser at the local elevator for 8,000 bushels with a firm commitment to deliver in March. The merchandiser will also negotiate a forward contract with other producers of different amounts and prices. Alternatively, a futures contract is standardized and facilitated through a futures exchange, such as the Chicago Mercantile Exchange (CME) and a commodities broker. In a futures contract, the buyer and seller of the contract could live hundreds of miles apart, and the buyer and seller do not know who sold or bought their contract! There are two types of futures traders: hedgers and speculators. Hedgers use futures contracts to as protection from price changes. Hedgers are producers or users of the underlying commodity. Farmers, ranchers, feedlots, ethanol plants, meat packers, and grain processers are a few examples of hedgers. Those who are hedgers will, at some point, own the physical commodity being traded. Hedgers use the futures market to reduce price risk. Speculators use the futures market with the hope of making a profit. Speculators generally do not produce or use the underlying commodity being traded. Rather, they buy or sell futures contracts in hopes of profiting from price movements in the market by buying a contract at a lower price and selling at a higher price. Speculators accept risk in the futures market. Both hedgers and speculators are absolutely necessary in the market! Sometimes speculators can get a bad reputation, but they are accepting the risk that hedgers are trying to diminish. Speculators also provide market liquidity, which allows producers and users of the commodity to enter and exit contracts more easily because there are more participants willing and able to trade contracts. The two positions one can take to initiate a futures contract are to sell or buy, which are also called short and long positions. A short position is when an individual sells a futures contract. A hedger uses a short position when he or she plans to sell a commodity in the future. For example, a corn, soybean, or wheat producer plans to sell their crop after harvest. This producer will take a short position in the futures market to protect against a decrease in the commodity price. By locking in selling price for the producer’s commodity in the futures market, it makes the producer’s profit more predictable. A long position is when an individual buys a futures contract. A hedger uses a long position when he or she plans to buy a commodity in the future. For example, an ethanol plant plans to buy corn throughout the year. This plant will take a long position on corn to protect against an increase in the commodity price. By locking in a purchasing price for the corn, the plant is able to manage and stabilize expenses. Futures contracts normally open for trade for 18-36 months in advance of the actual delivery date. Commodities are traded on a futures exchange with various contract months, and each month is assigned a symbol. Below is a table of commodities traded on a futures exchange and their contract months. Producers select a contract month based on when they want to deliver the physical commodity. Users of the commodity will select a contract month based on when they need the physical commodity. The following module will discuss the strategy behind this in greater detail. One standard contract for grain is 5,000 bushels. Mini contracts of 1,000 bushels can also be traded. Standard contract sizes for livestock is in pounds. 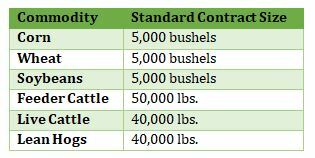 The chart below specifies common commodities, and the standard contract size. Individuals can trade multiple contracts at once (i.e. – 3 contracts of wheat is equal to 15,000 bushels). It is important for individuals to plan the price at which they are willing to sell or buy a contract. For producers, it’s helpful to understand their break-even and target prices so they can confidently lock-in prices that meet these goals. Once individuals initiate a futures contract, the price at which they bought or sold the contract is locked-in. Their contract is “open” until it is settled, and it will gain or lose value as the price of the commodity continues to change. Futures contracts require all buyers and sellers to maintain a margin account to offset the risk of the broker who underwrites the contract. Margin is collateral deposited by the hedger or speculator. A margin account contains a percentage of the future contract’s value, and ensures that if the market moves against the contract, the individual has enough money to pay for the loss. Margin accounts require anywhere from 2% to 12% of the total contract value to be deposited with the broker. For example, if margin is set at 10% and a producer has a contract value of $110,000, the amount the producer should deposit in their margin account is $11,000. The contract value is calculated by multiplying the size of the contract by the current price. For example, if December corn is trading for $4.00 per bushel and one contract is 5,000 bushels, the contract value is $20,000 ($4.00 price * 5,000 bushels = $20,000 contract value). The current futures price is compared to the contracted price and “marked to market”. When marked to market, the producer’s margin account will be adjusted to reflect any gains or losses. A producer must maintain a certain margin level to keep the contract. Futures contracts generally do not result in physical delivery of the commodity. Instead, futures contracts are most frequently settled by offsetting the position, which eliminates the requirement to make or take delivery of the commodity. Offsetting a contract means taking the opposite position on the same futures contract at the new market price. A gain is experienced on a futures contract if the price at which the contract is sold is greater than the price at which it was bought. The gain or loss is calculated by taking the SELL – BUY price. On May 1st, Richard went short a November Soybean futures contract at a price of $10.00. On November 1st, Richard offset his position by going long a November soybean futures contract at a price of $9.50. This removes his obligation to deliver beans to the futures contract buyer. On March 1st, Jenny went long an October Feeder Cattle Contract at a price of $135/cwt. On October 1st, Jenny offset her position by shorting an October Feeder Cattle Contract at a price of $150/cwt. This removes her obligation of receiving cattle from the futures contract seller. Futures contracts expire on the business day prior to the 15th calendar day of the contract month. If a contract is not offset by expiration, it requires the individual to make or receive delivery of the commodity. 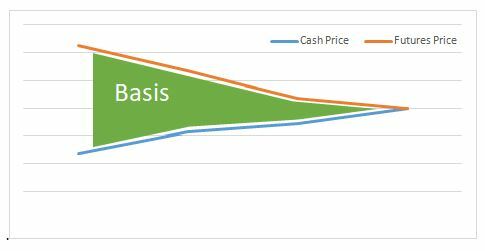 The reason futures contracts rarely result in delivery is because as the contract expiration date approaches, the futures price converges to the cash price. Producers and users of the commodity will still sell or purchase the physical product locally in the cash market. This saves the producer time and money by not needing to haul their commodity long distances to deliver on the futures contract. This also allows speculators to trade contracts.